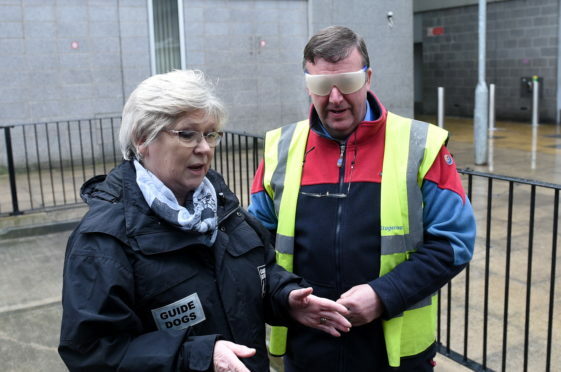 Pamela Munro, engagement officer for Guide Dogs Scotland, and Keith Boyd, Stagecoach bus driver, take part in training sessions at Aberdeen Bus Station. 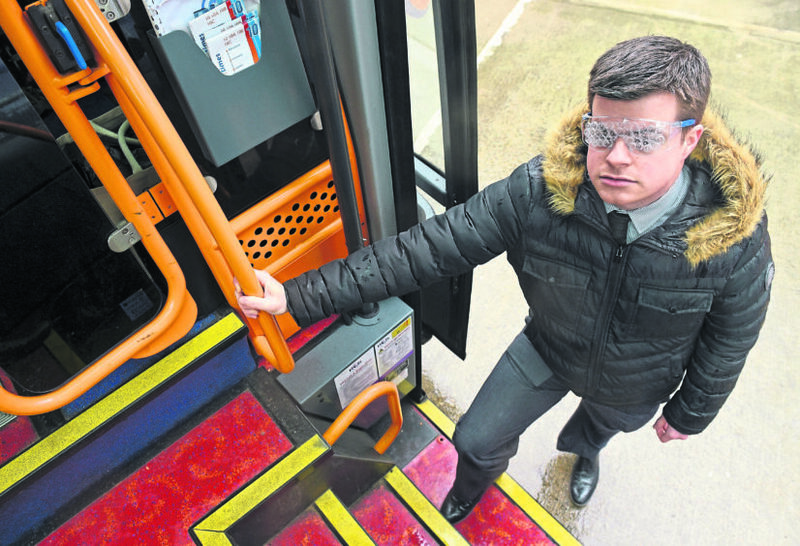 The shoe was on the other foot for bus drivers yesterday as they took part in an initiative to better understand the challenges faced by visually-impaired passengers. The Stagecoach event, known as Swap With Me, was held at Aberdeen Bus Station. Drivers donned a range of types of glasses which mirror different forms of visual impairment, including tunnel vision, cateracts, glaucoma and conditions related to strokes and brain injuries. Stagecoach North Scotland has signed a charter with charity RNIB Scotland which commits to making its services more accessible to passengers with sight issues. The operator also gave people with sight loss the chance to sit on the driver’s seat and get their perspective when someone comes on the bus. Keith Boyd, who drives the 37 Inverurie to Aberdeen service, donned a set that mimicked the experience of someone with cataracts. He said: “It’s been great speaking to people first-hand in a situation where you’re not actually driving the bus. “We’ve been able to take some time out and find out what are some of the problems that people face when they get on. Representatives from Guide Dogs Scotland and the RNIB were also there at the bus station. Among the issues they raised were that ticket machines are on different sides of the bus. They also highlighted that passengers sometimes miss the step when they move onto the galley and then have difficulty finding a seat if they have to walk further back. James Adams, director of RNIB Scotland, said: “It’s great that Stagecoach North Scotland has embraced our campaign so fully. Bus travel can be a life-line for blind and partially sighted people, who rely on buses more than most because they are unable to drive and taxis are too expensive for everyday journeys. Press and Journal Reporter Stephen Walsh taking part in the session. Picture by Darrell Benns. After trying on the various glasses, I decided to take on the same challenge as the bus drivers. There were various glasses available – some plunged me into total darkness, some restricted certain parts of my vision and others were completely blurred. When I eventually decided to step onto the bus, I was wearing a pair of lenses which mimicked tunnel vision. The pair had black cones covering the lenses and restricted vision to just a tiny circle in the centre of my eyes. The first problem I realised is that I could not see where the handle was at the side of the steps. Experience helped me find it, but it did occur to me that with different types of buses on the road, the distance I would need to reach out for would not always be the same. I then managed to get up the steps, again assisted by memory, and once I ascended to the top of the stairs, Pamela Munro, of Guide Dogs Scotland, asked me to swipe my imaginary bus pass. It was completely outwith the tiny line of sight and, as I flailed my arms and became unbalanced, she pointed out that ticket machines are sometimes in different locations.